My project this week is transforming a dresser I bought for $30 on craigslist into an entertainment center for our living room. So far I've painted it a soft white and removed the legs. Today I'll be doing a little detail painting, sealing the top, and adding shelves to the inside for the cable box, xbox, etc. Pics to come next week! The dresser. The drawers are perfect for a little detailed paint job. By the way, we ditched the ugly mauve wall that used to be down here and went for a charcoal grey. What do you think? 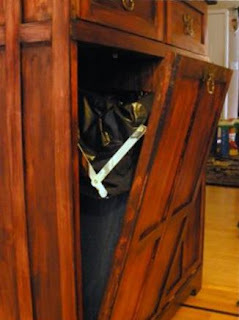 Speaking of repurposed furniture, check out this great hack from Ikea Hackers. What an awesome job! 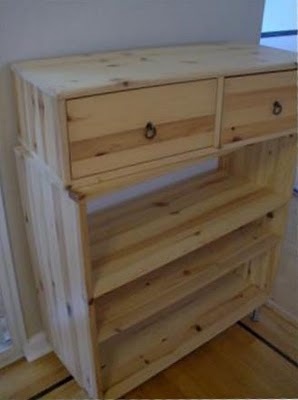 You'd never know this stylin' recycling center started off as simple pine shelves! Hidden recycling. Such a great idea! 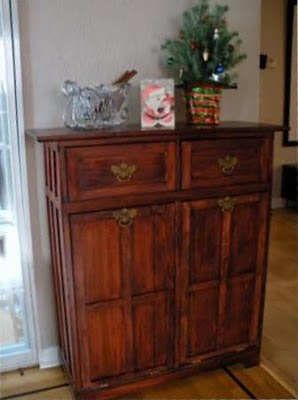 Click here for instruction and pics of Christin's DIY. What about you? What projects are you working on this weekend? The dresser is going to look incredible. I can't wait to see it finished!